Want to stretch your training dollars without compromising on quality? 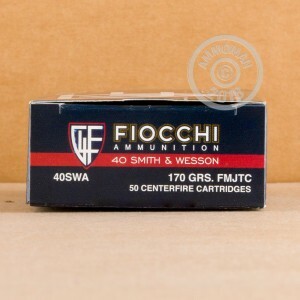 Grab this 1,000 round case of .40 Smith & Wesson ammunition from Fiocchi. 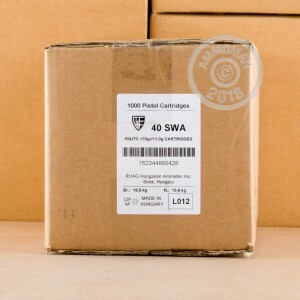 This case is divided into 20 boxes of 50 rounds each. Use it with any handgun firing .40 S&W ammo including Glocks, S&W M&Ps, Springfield XDs, and more. Each cartridge in this case of 1,000 fires a 170-grain full metal jacket bullet at a muzzle velocity of 1,020 feet per second. While these specs differ slightly from typical 165-grain or 180-grain loads, shooters should notice virtually no difference in the short range external ballistics or felt recoil of this load. Fiocchi of America is located in Ozark, Missouri and produces much of the Fiocchi ammo sold in the US; the remainder is imported from the company's global headquarters in Lecco, Italy. 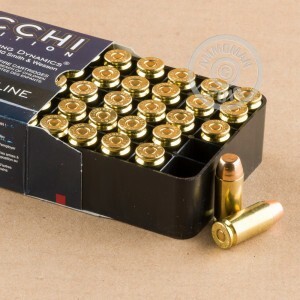 All Fiocchi ammo uses noncorrosive Boxer primers and reloadable brass cases. Pick up this case (or any other items totaling $99 or more) from AmmoMan.com to get free shipping!